Guidance, taxes, and the long term plan are just a few topics that were covered in its most recent conference call. 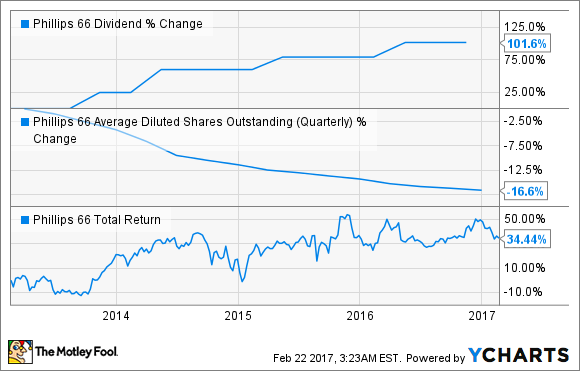 Phillips 66 (NYSE:PSX) isn't just hoping that 2017 will be a better year for the refining giant, it is planning on it. While the environment for refining isn't doing the company any favors as of late, management sees the company making some big strides in its other business units that should lead to better days ahead. On the company's most recent conference call, management discussed how it foresees 2017 shaping up as well as covering some of the topics du jour such as tax reform. Here's a few snippets from Phillips 66's most recent conference call that should give you an idea of what management is thinking for this year and beyond. 2017 hasn't exactly started out on a great foot for refining companies. Gasoline and diesel inventories across the U.S. are high, and the winter season is always a bit weaker in terms of demand. Several other execs in the refining business are already anticipating a tough year for refiners, but CEO Greg Garland thinks that these tough market conditions will start to improve as the year goes on. I'll kind of start with we've got a lot of inventory with crude and products. And so, for us, first half of '17 feels about like 2016 to us at this point in time. I think as you start moving into the back half of 2017, we see some opportunities certainly for margins to improve. But I think we need to pull down some inventories. And that also assumes that demand's going to be fairly good, and it's been fairly robust in 2016. We expect, I would say, good demand growth in 2017 in Refining. So the other thing I would say, a heavy turnaround quarter, it looks like, in the first quarter globally across the refining space. And so we'll see how that actually plays out, but there is a lot of turnaround activity across the globe. And that may back up some crude, but I think it will give us a chance to pull down some of the product inventories. So as we start moving into the second quarter, back out to second quarter, we think things start to get better. on Chemicals, we're still pretty bullish about demand growth. We think that we're still growing at 1.5x GDP in the Chemicals business. And I think we see good opportunities in 2017. One of the big benefits of Phillips 66 versus other refining companies is its large presence in Chemical manufacturing through its CPChem joint venture with Chevron (NYSE:CVX). On multiple occasions, Garland and other members of the Phillips 66 management team talked about the start-up of its $6 billion ethane cracker plant in the U.S. Gulf Coast. Once this comes online, it will allow CPChem to significantly lower its capital spending and throw off more cash to both Phillips 66 and Chevron. Natural gas liquids has been an interesting business over the past couple years. While oil and gas production have slowed down a bit from less drilling, production of NGLs has remained rather strong. As a result, there have been a lot of opportunities for processing and chemical companies to take advantage of the cheap feedstocks. Here's the thing, though, according to Garland, the uptick in production for natural gas and oil is going to present a unique challenge for NGLs in the near future. We think, with increased production, we're not going to have enough [NGL] demand in the U.S. to clear either the heating markets or petrochemical markets, and you're going to have to export. So we do think that arbs [arbitrage opportunities] will open up certainly in 2017, but particularly the back half of 2017. Phillips 66 and a small handful of companies could take huge advantage of this situation. NGL prices overseas are much higher, and they are much less costly to export than liquefied natural gas. Longer term, though, this continues to bode well for petrochemical manufacturing. Phillips 66 is looking to make a final investment decision on a second fractionator unit at its Sweeny complex with plans to add a third as well. [W]e would expect to see cash coming out in 2017. As you know, through that restructuring, we put in place some conditional IDR [incentive distribution rightts] givebacks, if needed, at the MLP level. But with the way that the markets have gone and NGL prices, that doesn't look so likely that would be needed in the current environment. So we do expect we'll start seeing cash coming back to the owners this year. From the standpoint of growth, with the simplification, clearly, any growth activities will take place at the MLP. And so they need to look at their overall capital structure and cost of capital from the standpoint of the ability to issue debt and equity. Clearly, with the leverage that's there at this point in time, you wouldn't expect to see debt be an issue without some equity as well because they're kind of at the high end of the range from a leverage standpoint. But the encouraging news is they're seeing opportunities as well. So the growth opportunities are starting to surface again. And they announced a little bit of that at the time of the restructuring. [I]f just border tax goes through in the form as we understand it, we would pay more taxes on the Refining business at 20% [corporate tax rate] than we pay at 35% today. So that's a negative. We think crude prices go up 25%. We think gasoline prices go up $0.30, $0.40 a gallon in that scenario. We're worried about demand destruction in that case and what happens. So we're concerned about second-, third-, fourth-order impacts beyond just that, Doug [Leggate, analyst at Merrill Lynch]. But you think about increased domestic production that gets incented with higher prices, probably more midstream infrastructure, so directionally, it's probably good for our Midstream business. And you think across the Chemicals platform. And historically, we've exported between 15% and 25% of the ethylene produced in the U.S. in derivative equivalents. And I think that that's probably similar to what people are thinking going forward. And so from an export perspective, the border tax adjustment would be good for the Chemicals business. So we have to think about it across all 3 of our platforms and how it impacts those platforms. The thing with major changes to the current tax code is that there are a lot of moving parts that will have both beneficial and adverse effects to a business, so investors shouldn't simply look at tax reform as a universal good. Well, I think that as we think about the hierarchy of how we allocate cash, the first thing is sustaining capital. That's $1.1 billion or so. And the next goes to our dividend, and that's $1.3 billion. And we'll grow that every year going forward. And then, we think about our investable opportunities and the returns that we could generate from those investable opportunities versus what we think the returns we can generate by buying our shares back in. And so we've got a natural tension there, but there's kind of a competition there for that. And at this point in time, we don't think we see anything different from the guidance we've given in terms of the kind of the 60-40 allocation of reinvesting in the business versus distributions back to our shareholders. With natural gas and natural gas liquids remaining so cheap in the U.S. thanks to the shale boom, it would not be surprising if growth capital spending takes a little bit more priority in the coming years to build out even more petrochemical production and export capacity. Once those opportunities become fewer and further between, share repurchases will probably play a bigger role.